One of the most important questions in the economic science is the manner in which the product prices are brought about. She determines what the value is, that consumers attach to a certain product. Following Adam Smith and especially David Ricardo, Karl Marx has developed a theory of value, that makes the value of a product entirely dependent on the amount of labour time, which is expended for its production. The (exchange) value of a product is proportional to the amount of invested labour time. A product is a carrier of value, because human labour is accumulated in it1. Although Sam de Wolff has always called himself a marxist, and felt like a marxist, the labour theory of value has not become a squeezing strait-jacket for him. As is already clear from the columns about the conjuncture, De Wolff tries to renovate and advance the marxist theory. He has this urge to improve also with regard to the labour theory of value. In this sense De Wolff is a child of his time. For already in the final days of Karl Marx a new price theory had arisen, which makes the product exchange dependent on the considerations of utility, and not on the amount of needed labour time. The essence of this theory is, that the consumer wants to maximize the utility of his expenses. This idea was already advanced in 1854 by the economist Hermann H. Gossen, but it would take another twenty years before it is worked out into a usable model by the economists William S. Jevons and Léon Walras. The new theory is hostile towards marxism as far as the exploitation of the workers by the producers is denied. The theory of utility was accepted quickly by the Dutch economists, even those who called themselves marxists. To the knowledge of your columnist only two Dutch marxists have really studied the conflict between the traditional labour theory of value and the theory of utility. This is of course Sam de Wolff, as will be explained further on in this column, and in addition the then quite well-known Rudolph Kuyper2. De Wolff is not really interested in the price formation herself, but mainly in the total size X of the national production. In other words, he tries to determine the factors, which fix the gross national product. He hopes that this information can support and complete his model of the economic conjuncture. Although De Wolff embraces the theory of utility, he still wants to furnish his argument with his own designations for all sorts of economic quantities and phenomena. 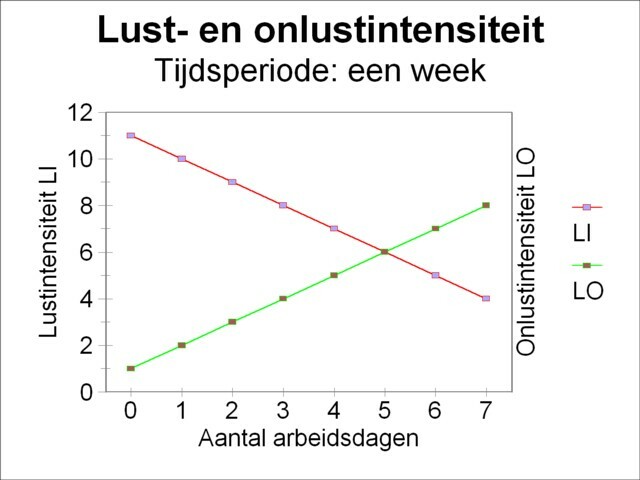 For instance, he is not very pleased with the word utility and prefers to use the word pleasure (in Dutch lust). This column adopts his designation, in order to preserve the originality of his thinking. In the formula 1 x is the amount of product in possession of the consumer, Δx is the additional amount dat he can get, and ΔL is the additional pleasure4. The remark just made about the progression ("become satiated") implies, that the intensity of pleasure diminishes according as x increases. At the end of this column an example will be presented, where the progressive decrease is clearly shown. In the formula 2 t is the duration of the expended labour, Δt is the additional time that the person could work, and ΔO is the additional displeasure of the worker. This shows how the labour time enters in the theory of De Wolff. The intensity of displeasure rises according as t increases (see also the example at the end of this column). The formula 5 determines the size X of the production in a society of a single person. For from the equality the total amount of labour time can be calculated. The total size X is obtained by a multiplication with the labour productivity ap. X is just the quantity, that De Wolff tries to derive. Unfortunately the limited practical applicability of the Robinsonade detracts somewhat from the success of the model. The income from capital or from rent is missing. In a society of a single person there is no wage struggle5. Both intensities are shown as graphs in the figure 2. The breaking point is found by substitution of the formulas 8 and 9 in the formula 5. One finds as the result, that the pleasure and displeasure are in balance, when the Robinson-person works during exactly topt=5 days. 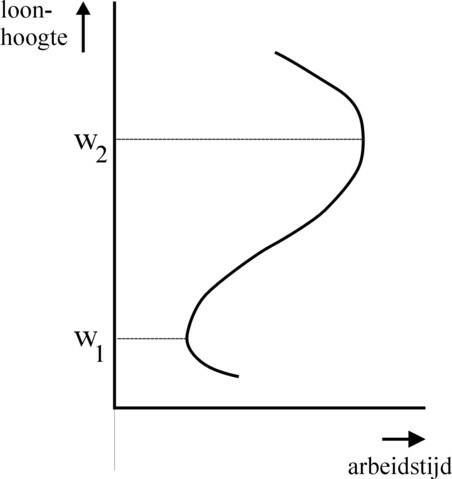 The same result is obtained by reading in the figure 2, where the point of intersection of the two curves is located. As long as the person works less than 5 days, he will long for extra sacks of corn. As soon as he keeps working after the fifth day, he will dislike the extra labour in relation to the added pleasure of corn. He will have left 2 days of his time period for relaxation. Because of the assumed labour productivity the total amount X of product for the given time period is equal to 1¼ sacks of corn. If a model accounts for both the wage, the interest and the rent, then the gross national product can grow, while the wage remains unchanged. Therefore the wage level is commonly considered to be a separate quantity, independent from the national income. In such models the willingness to work is determined primarily by the wage level. The figure 3 shows, that two wage levels can be discerned. Below the wage level w1 the willingness to work increases with a decreasing hourly wage. Then the workers need to work for instance also on sunday in order to earn a living. Between the wage levels w1 and w2 the income covers the existential needs. Then the workers will only accept longer working-hours, if the hourly wage actually rises. This is the range of wages, that pertains implicitly in the model of De Wolff. Above the wage level w2 a higher hourly wage does not provide an incitation for the workers to accept longer working-hours. On the contrary, they prefer to spend their growing income on leisure activities. The labour time belonging to the wage scale w2 corresponds, as it were, with the optimal labour time topt in the Robinsonade.